If there is one rule that we go by here at Sound Liaison, it is trust your ears. So when ifi approached us for a sampler to accompany the release of the new micro-iDAC2, we first sat down and gave the device a good listen. Hearing how faithfully the iFi micro-iDAC2 reproduced our native studio masters, we could not help but feeling proud. Proud that iFi chose to approach our little label with a request to add the ''sound track'' to the release of such a superb product. With the micro-iDAC2 iFi is proving that it is possible to obtain state of the art quality of sound in a portable device. We at Sound Liaison are putting a great deal of time and effort into obtaining the best possible sound. We are especially particular when choosing and placing microphones, having realized that attention to detail at the very beginning of the recording process pays of, when having to realize the final mix. 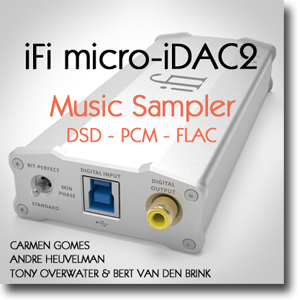 iFi is showing the same kind of attention to detail when choosing the components and features in the micro-iDAC2, making the device the perfect companion for our downloads. So please go ahead, download the files, place yourself in your optimum listening position and trust your ears. If you have the ifi sampler coupon code, available on the ifi website (audio blog), the files can be downloaded free of charge. The coupon code can be entered in the Shopping cart. So first select and Add selections to cart. In the Shopping cart you can enter the Coupon code by clicking on 'Enter a coupon´. This Music Sampler download contains 3 songs in 3 different formats, DSD (dsf), PCM and FLAC, so in total 9 audio files. ''Impromptu'' was recorded live directly to DSD using the Tascam DA-3000 DSD recorder and simultaneously to PCM with the RME UFX. an analog signal chain, using state of the art professional equipment to the Tascam DA-3000 DSD recorder. Microphones: Main: Schoeps MK5 (2x), Voc: Audix SCX-25, Drums: SE Rn17 (2x), Neumann U47, Bass: JZ V67, Guitar: Audio Technica 4080.